10 April 2014 – Hong Seh Marine is taking part in Singapore Yacht Show from 10 to 13 April at ONE°15 Marina, Sentosa Cove, displaying three models from Ferretti Group brands, Riva 75′ Venere Super, SportRiva 56′, Pershing 64 (debut) and three models from Cranchi Yachts, Atlantique 40′ Fly (debut), 54 Fly and 64 HardTop. 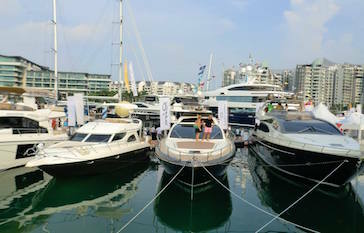 The Singapore Yacht Show is one of the most celebrated international yachting events on the global calendar and the event epitomises luxury, bringing together world-class yachts, glamorous social settings, high-end entertainment and an enviable range of prestige products and brands into the ultimate luxury experience. In attendance are Mr. Edward Tan, Hong Seh Group Executive Director and representative from the shipyards, Mr. Fabiomassimo Discoli, Ferretti Group Asia Pacific Sales Manager and Mr. Stefano Luraschi, Cranchi Sales & Marketing Manager, demonstrating their total commitment and support to the Singapore market. The new 75’ Venere Super is the latest edition of one of the shipyard’s most popular models. Developed by Officina Italiana Design, the designer of all the yachts in the Riva range, in association with AYT&D – Advanced Yacht Technology & Design (Ferretti Group’s naval research, development and style centre) this is a perfect demonstration of the Ferretti Group design ethos. Interiors and exteriors are rendered in painstaking detail, offering greater comfort during cruising and optimized space. The flybridge has been enriched with a hard top featuring an elegant, aerodynamic line and a comfortable, six-seater sofa. The overall feel is that of total elegance and luxury. An expansive window distinguishes the Roman Bronze hull, and highlights the elegance of the Riva Cream superstructure. The SportRiva 56’ is a yacht which integrates the flybridge concept with the sporty lines of an Open, whilst still maintaining Riva’s style. Designed by the skilful hand of Mauro Micheli and the team at Officina Italiana Design, this model, set between the 52 and 63 feet of Rivale and Vertigo, has been studied to satisfy the demands of owners who seek the convenience of a closed, air-conditioned upper salon with the Open style. The SportRiva 56’ is sporty, aggressive and modern. Her lines give her a strongly dynamic appearance that, together with a number of highly innovative solutions, makes this an exceptionally progressive and dynamic design. This yacht exudes the taste of Riva’s long tradition of excellence. In the Pershing 64, style, innovation, technology, and ultimate comfort are combined to outstanding effect. The Pershing 64 includes amongst its many features an elegant and harmonious long side window that gives the craft’s structure a particularly sleek appeal, as well as making the spacious saloon and helm station area bright and airy. The exterior is complete with the kind of luxuries usually only found on larger yachts, such as a double stairway that leads to a spacious cockpit. In terms of performance, the craft’s twin 1550 hp MAN engines and Arneson ASD 14L drives, with Rolla surface propellers, guarantee peak speeds of no less than 46 knots. This again demonstrates the boat’s remarkably high standards. The Cranchi Atlantique 40′ Fly is a sophisticated European motoryacht designed for entertaining and long range cruising. Comfortable and spacious overnighting accommodations for four and with plenty of cockpit and cabin space for you to entertain all your friends and family. The swim platform on the Atlantique 40 is large and provides easy boarding. Operated on two Volvo Penta D6 engines, she is a fuel efficient yacht. Perfect for long range cruising. The beautiful Cranchi 54′ Fly is designed to feel safe and secure when traveling in all kind of seas. With remarkable layout, great interiors and maximised space on the main deck. With three well appointed cabins and two bathrooms, the interior is spacious and beautifully finished. Italian style is seen throughout. The flybridge is large and has plenty of seating and a large sunpad forward of the helm station. All you need in 54 feet, from hydraulic swimming platform to launch the tender from the garage, to the 3 spacious cabins and all the comfort of a flybridge or a sunbathing area on the hard top version. In the Cranchi 64 Hardtop, you will find the usual elegance and flair associated with Italian design. With a full length sliding hard top providing panoramic views and windows running the length of the main deck, the 64 HT offers a truly remarkable experience. Equipped with two MAN V12, accommodation for 7+1 with 3 cabins and 1 crew cabin. The search for technical and stylistic perfection reaches unprecedented levels.